I owe Richard Wagner, Ph.D., ACS an apology. He sent me his book to review last year. 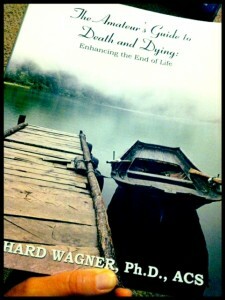 I read the first three chapters of The Amateur’s Guide to Death and Dying: Enhancing the End of Life and put it down. It was too close. Too close to Benjamin’s stillbirth. Too close to my terror (sprung from grief) that my daughter would die too. Too close to my own fear of dying and leaving her motherless. A year later, I picked it back up. Using the construct of a 10-week support group, the book shares the journeys of ten group members, each confronting their own mortality for different reasons. You, the reader, are the final group member and there is space for you to record your thoughts each week. The fictional characters and the group format are based on PARADIGM Programs, Inc., a non-profit organization founded by the author and dedicated to enhancing end of life. The dialogue is sometimes awkward and a bit cheesy, but the book more than makes up for that in the way it covers a myriad of topics with intelligence, compassion and expertise. I tend to read with my heart wide open and once I could keep them straight, I found myself growing fond of the characters. I got all teary at the end as several of them discussed their impending deaths. I appreciated and agreed with the author’s treatment of grief and all it encompasses. That in itself is worth recommending the book, as many myths and misconceptions are still perpetuated in grief-related writing. But this workbook goes far beyond grief in the way it addresses such topics as the legal details of dying, sexuality and end of life, spirituality and being in right relationship with yourself and others, and the physical processes of dying. As hard as much of it is to read and think about, the information contained here is invaluable for all of us, whether we think we are currently dying or not. With candor, humor and understanding, topics that most of us prefer to ignore are brought to light and looked at through the individual lenses of the group participants and the presenting experts. If you are actively dying or have been shocked into facing death for any reason, I recommend this book as a companion on your journey. And if you’re alive and well as far as you know, read it for a greater understanding of those around you who are approaching death, and for the guidance it will give you in facing the inevitability of your own mortality. P.S. Forgive me Richard, and thank you for the work you do in the world. How brave of you to pick up that book again and finish what you’d started. How immensely brave.